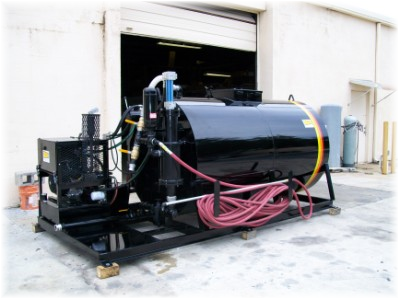 These skid mounted Models are available with 700, 1100 and 1600 gallon round material tanks. 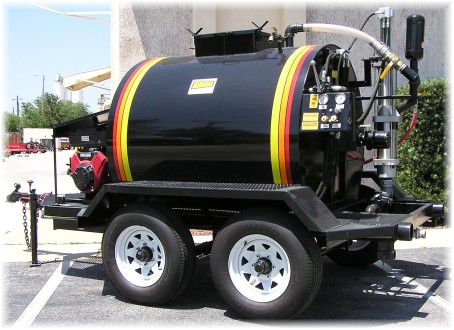 All tanks have the forward and reversing, full sweeping rubber wipers. The 700 gallon has an 18 HP engine and the 1100 and 1600 have 25 HP engines. This Seal Coating machine has rubber wipers on agitator blades with forward and reversing agitation. The power pack system is mounted on a skid that can easily be bolted to a truck and is available in a number of layout configurations. It is powered by a gasoline fueled, air-cooled 18 H.P. engine rated at 3600 R.P.M. 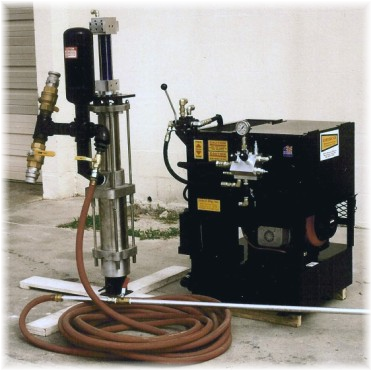 The system includes a 1 gallon surge chamber on material pump discharge, a 2” NPT basket strainer on material pump inlet, and a directional and flow control circuit for driving a hydraulic agitator motor. Agitator Shaft: 2" to 2 1/2"
Some seal coat companies prefer the diaphragm construction so we designed this machine. 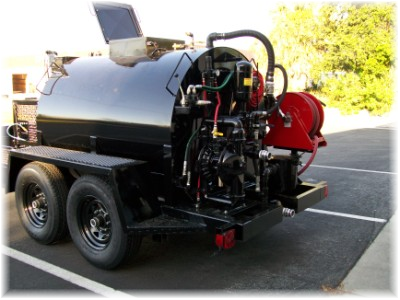 If you are used to spraying with a hydraulic pump machine we're sure you'll achieve the same smooth spray with this machine.